The weather is warming up and so 26 yachts came to the start line for the fifth of the Skinners Brewery sponsored Tuesday points series. The Race Officer Ron Jones positioned the Committee boat on the eastern shore near the Waterloo racing mark. The wind had slowly backed around from the Northwest to a predominantly Westerly direction and was reducing in strength as the sun started to dip toward the horizon. 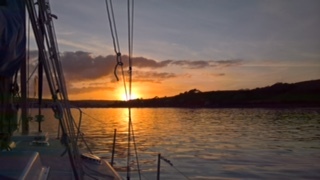 Ron set an ambitious course for the solitary M class Mirri, 12 Q class yachts and the 7 U class yachts of 5.9 miles, especially as there was a continuous ebb tide. 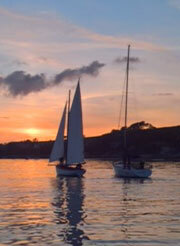 W class yacht Sweet Friday, Len Cheshire was joined by Thirteen, Robin Roebuck and Amneris, Mike Robson. In the event Mary, Neil Hopkins joined W class in his solitary Sunbeam. 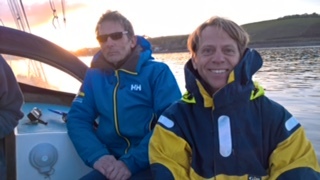 Ian Munday, Neil's crew, has come over from the dark side of cruising to enjoy the light of racing! Welcome aboard. They had a shortened course of 4 miles. The horn sounded and a while later Mirri, Alister Wright started. 5 minutes later 12 Q class lined up on an extremely long start line. Come on guys, for the second time this season several boats were over the line at the start in an untidy melée causing the race officer to issue a general recall for them. Unfortunately that means going to the back of the Queue, excuse the pun. On Trifle we did not get the best of starts being 20 seconds late and pinned between two GK 24s. A gap appeared to windward and we tacked off into clear air. Another tack saw us into third place and yet another tack saw us take the lead. A series of good calls from the crew and luck from the wind pixies saw us round the Trefusis mark way ahead of the fleet. OK now a major decision: which way up were we going to fly our spinnaker for the leg to Carricknath down by the lighthouse. A port clew hoist did not seem to work so we dropped the kite and tried a starboard clew hoist. That didn’t work either so in the end we reverted to the usual head up hoist! Ahh that worked and off we went. Nigel and Jess Rowe in Kaimana chased hard, Nigel has really got to grips with his new GK24. We rounded Carricknath, went to Pendennis, back to Carricknath round Black Rock Lateral buoy and started to beat back up the harbour. The Race Officer had by now moved the committee boat by the Northern arm of the Docks to shorten course. Mirri, Alister Wright made the finish. Sweet Friday, Len Cheshire won the W class, beating Amneris, Mike Robson and Thirteen, Robin Roebuck in that order. Len told me in the bar that he had a great sail on his own: no crew again. He had a few tangles with Mary, Neil Hopkins who although sailing with the W fleet was racing in his own class. Neil finished as a sail over. Alan Perham in Clementine retired within sight of the finish boat. We could see the crew on Winnie, Arthur Williams trying so hard to extract every last ounce of wind to get to the finish. Eventually they resorted to getting out the sweeps and rowing back to the moorings against the tide, having retired. As we were on our last leg we could see the Q class yachts struggling up behind us. Per Elisa, Robbie Tregear had a pretty good lead from the rest of the fleet. One by one we heard crews on the race channel reporting in their retirement as the sun set in a blaze of bright orange. Popincoota, Alan Grose came up from the depths of Black rock followed by Wilkie to within a boatlength of Trifle who had parked 50 yds off the committee boat. We struggled with a dying if not dead wind and an adverse half knot of tide. The end was in sight but “Alas!” 2045 hrs came and passed. Time out and the race was over. U class and Q class were all involuntarily retired. Thanks to Sarah our Caterer, Jennie, the Barmaid, Jeannette and Sue in the ops room who had a long wait for the returning crews. We look forward to fair weather and 10 knot breeze on Saturday for the second Cockwells series.